Each year, many new smartphones and tablets are released. 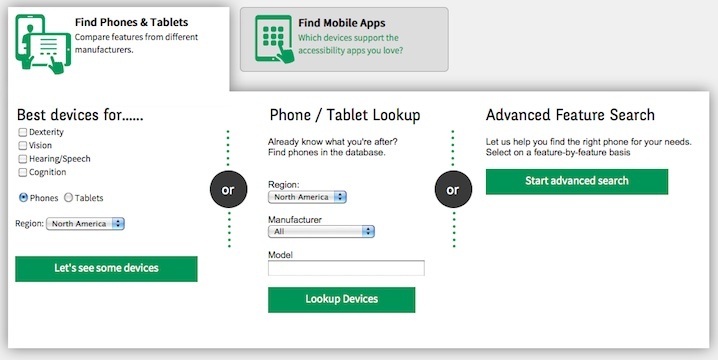 For people planning to purchase a new device, it difficult to gain a good overview and make an informed choice – especially if they have special needs that require specific accessibility features. That’s where GARI, the Global Accessibility Reporting Initiative, comes in. The GARI.info website has been set up to help users with special needs choose an appropriate smartphone, tablet or app. GARI is run by the Mobile Manufacturers Forum, an international association of telecommunications equipment manufacturers with an interest in mobile or wireless communications. GARI lets you search and compare phones, tablets or apps that cater for a specific needs and disabilities in five languages. It contains devices since 2008. Covered are not only needs related to vision, but also to dexterity, hearing/speech and cognition. Does a phone have a physical keyboard or keypad? Does the keypad have tactile markers? Do buttons provide audible or tactile feedback when pressed? Can the device be voice-controlled? Can the text size or the brightness of the screen be increased? The GARI database makes these and many more features comparable across boundaries of manufacturer or operating system. The idea of GARI is that participating telecom equipment makers provide a data sheet for each new device they release, covering more than a hundred accessibility features. The direct input from manufacturers should ensure the timeliness and accuracy of information - at least for physical device characteristics that do not change during the lifetime of the device such as the form factor, screen dimensions and brightness, connectivity options, and buttons or keys. Especially for blind and low vision people, accessibility will often depend on the version of the operating system. In modern smartphones, new system versions can introduce significant improvements that can be critical when judging if a particular device is appropriate for users. For example, before Android 4.1, the TalkBack screen reader was not sufficiently mature to make Android devices workable for blind users. At the time of writing, the GARI database contains 600 devices, with around 260 listed as being available in Europe. To increase coverage, GARI is dependent on voluntary information provided by its members. The manufacturer select menu in the search interface betrays that currently, some important mobile device manufacturers are still absent: there’s no Huawei, no ZTE or HTC. While Samsung devices are up-to-date for North America, there are less models listed for Europe. What is not immediately apparent to users is that information for some models may actually be present, but will only be shown when users select the region (e.g. North America') for which the device has been entered. Picking 'Europe' as region generally results in fewer hits even if the same device is actually available in Europe. The search interface offers three ways in. The first brings up Best devices for one or several of four broad categories of impairment: dexterity, vison, hearing / speech, and cognition Categories to choose are phones or tablets, and then there ist a region selector defaulting to North America - more on that below. Next, there is Phone / Pablet Lookup where the user can filter devices by selecting a region (such as North America, Asia Pacific, or Europe), a manufacturer, and a model. 'Manufacturer' can be set to 'all', and 'model' be left empty to catch all, but a region must be picked. For European users, this will often lead to a situation where GARI shows far less results than present in the database (ignoring slight regional diffferences between models). For example, selecting region Europe, manufacturer Samsung and leaving Model empty, the search brings up just three models, all of them feature phones. The Galaxy range is absent. Selecting 'North America' as region, we get a list of 119 devices, so coverage is a lot better here. Many users picking Europe as region will simply conclude that the search function is either not working properly or that the coverage is poor. Finally, there is the Advanced feature search that allows a more fine-grained filtering of devices, for example, according to must-have features. 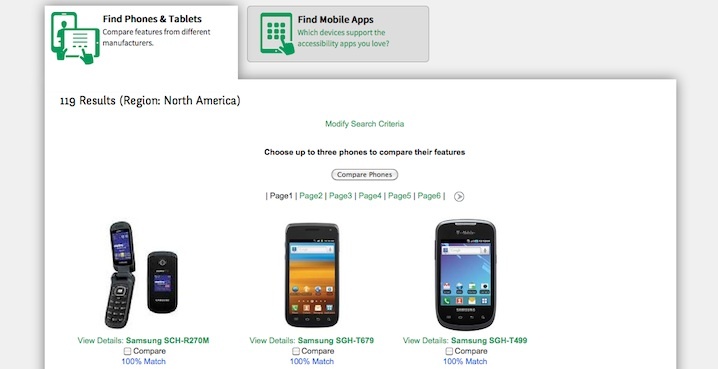 Figure 1: GARI"s search interface offers two tabs, "Find Phones & Tablets" and " Find Mobile Apps".The phone and tablet search has three options: Best devices for... (select specific type of need such as visiobn or dexterity), Phone?Tablet Lookup where users can select region, manufacturer and model, or the Advanced Feature Search. One difficulty is that GARI uses the technical descriptors for particular model variants such as 'Samsung SCH-I535' in its listings, not the widely known market names. That the SCH-I535 is actually a Samsung Galaxy III model will be apparent only to phone buffs or users making a serious effort to match both. Presumably there will be little technical difference between US and European models of the Galaxy S III, so it would be good to make users aware that there are relevant results in other regions when a region with fewer entries was selected. Another issue is the currently half-baked implementation of the device comparison function. If you select vision, phones and North America and choose the option 'Let’s see some devices', you currently get 267 results in a grid listing (three phones in a row) spread across 14 pages. You can select a checkbox for each phone that you want to compare. However, the application does not remember checkboxes checked should you want to pick phones from different results pages. This limits the usefulness of the comparison function. The error message you get, 'You did not choose at least 2 phones to compare', is factually incorrect – GARI simply isn’t smart enough (yet) to use some AJAX scripting to store user selections when browsing search results pages. Figure 2:The search results are shown as a grid of thumbnail images of devices with links to a details page per device. Currently, results cannot be ordered by most recent device. Users can tick checkboxes to select devices for comparison. Another observation when searching devices with GARI is that much of the kit listed is no longer on sale (or only available used). This adds a lot of noise for those users who want to compare new devices. Blind and low vision users know that in operating systems like Android, accessibility has significantly improved only very recently. Limiting the search to recent models only would make perfect sense for the dominant use case for GARI - making informed decisions before the purchase of a new device. The choice of apps in GARI is currently still rather small. The information is provided by the developers themselves. GARI has extended invitations to a very wide network of developers - and continue to do so - to try to get as many apps listed as possible. The ultimate aim is to see many, if not all, of the most useful apps listed on the site. Developers among readers are encouraged to list their apps on GARI. More information for app developers is available from the GARI site. GARI covers many important features that blind and low vision users will want to know about. But blind users should be aware that they will need additional information about the accessibility of the operating system and screen reader the device comes with. There is a further important aspect of Android devices: the various manufacturer "skins" - propriety interfaces built on top of Google's Android - mean that some devices may be harder to use than 'Vanilla Android' or not be accessible at all. This important aspect is currently absent in the GARI dataset. Manufacturers' update policy is also a critical aspect that can and should influence device choice. Is the device's operating system going to be updated to a more recent version of Android at all, and when will this happen? Such factors won't be easy to include in the GARI dataset in a consistent way - yet they are often critical for the choice of device. We have asked the developers of GARI to comment on an earlier version of this article. We have received some clarifications, and an indication what's in store for future versions. Regarding coverage, GARI made it clear that they are making efforts to get manufacturers to provide more timely input also for regions outside North America. As more manufacturers enter the fray, the coverage should get better and thereby, the service more comprehensive. The speaker for GARI, Michael Milligan, expressed that the next feature review cycle in October will also look at options for including information on mobile screen readers as well as additional interfaces or 'skins' in Android-based devices. He expressed that GARI generally welcomes feedback on the service and is ready to further improve the search interface, for example, by enabling comparisons between devices listed on different results pages. GARI.info is a very promising service that can save users looking for particular features in their phone a lot of time. The GARI database is (to our knowledge) the only place where the myriad of technical details found in product spec sheets and company websites are brought together in a coherent way to enable a comparison of accessibility features. This is a great benefit for users with special needs. Some improvements to the search interface would be very welcome. The most important might be to provide a mapping between terms that average users will use for searching (e.g., Galaxy) and the technical names currently used. A cross-mapping between regions might be helpful for users who want to identify relevant device information listed only for another region, even if the model is slightly different. A release date should be added to the model fact sheet as this is critically important information for users. This would enable a filtering of devices by release date to focus exclusively on recent models. As we have said, GARI provides information on device features not just for blind and low vision users, and having all these in one place is very useful. Blind users should be aware that they will often need additional information about the capabilities of built-in or additional screen readers and display customisation options.